Here we go again with another sparkling year of DA joy. Express your general DA joy here. I’m impressed with the number of definitions included in the wordplay. DA must have pulled out his notebook for this one. My New Year’s resolution—to solve at least three-quarters of each DA, and to understand at least half! Recently I moved into the digital age and now read my SMH Digital Edition four days a week on my desktop computer. No more breakfast and crosswords in bed on those days. 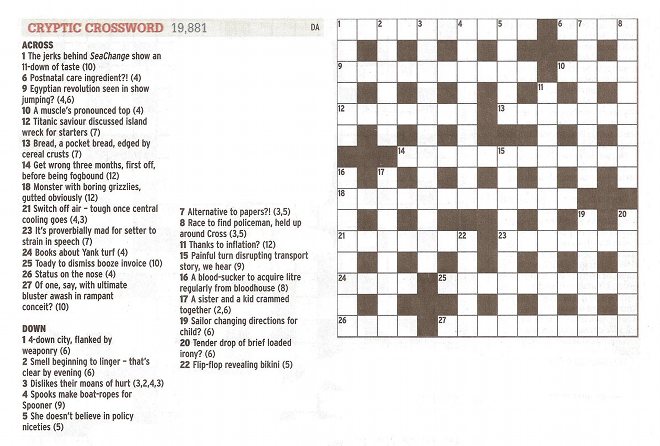 I have to make hard copies of the crosswords, but the font seems to be even smaller than in the paper. I have tried to increase the font size or change to a landscape copy that might have larger font, but that doesn’t work. I phoned the SMH for advice, without success. I am thinking of buying an IPad or similar device, and the clincher would be if the daily crosswords are available in an interactive format. The SMH adviser thought they might be available, but didn’t sound very convincing. The young salespeople in Apple and JB stores aren’t interested in crosswords, and won’t let me type my own address and password into their Pads in case I compromise my security. Unfortunately none of my cryptic crossword friends have an IPad that I could try out. 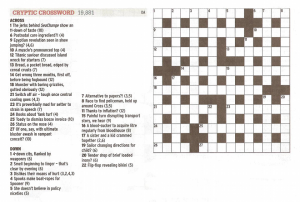 Does anyone have any advice for me please for me about continuing to exercise my brain by doing the Herald crosswords, especially the Friday DA Cryptic? Edwina, I use the SMH digital edition, and find the font size is not a problem, even without my glasses, if I print it landscape on A4. If anything, it’s slightly more readable than the Guardian crosswords, which are designed to be printed portrait. Others here have mentioned that the SMH iPad app lets you do the crossword interactively, and gives a pleasing ding when you’re done. No word on whether it simulates the ability to rip the thing to shreds with a ballpoint in frustration.